To check your Evans Cycles gift card balance click here. Founded in 1921 as F. W. Evans, Evans Cycles now has 50 stores up and down the country stocked with quality bicycles, spares and accessories and staffed by real cycling enthusiasts. Evans’ ethos is to bring their passion for cycling into everything they do – it’s certainly appreciated by cyclists; they have over 100,000 fans on Facebook! Click here to find your nearest Evans Cycles store. Evans Cycles has recently been bought by the Sports Direct group which as an internationally successful company should safeguard Evans for years to come. Where can I check my Evans Cycles Gift Card Balance? You can check your Evans Cycles Gift Card balance online by clicking here (see box half way down the page). You can hand over the card at any Evans Cycles store and one of the team will check the balance for you. Where can I buy an Evans Cycles Gift Card from? Evans Cycles gift cards are on sale at all Evans Cycles stores. Click here to find your nearest Evans Cycles store. You can also purchase Evans Cycles e-gift cards online from their website – click here for details. Evans Cycles gift cards are also available from larger branches of Tesco. Where can I spend my Evans Cycles Gift Card? Anything else I need to known about Evans Cycles Gift Cards? 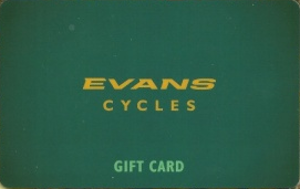 The Evans Cycles Gift Card will expire after 24 months from the last purchase if unused. Checking the balance will not reset the validity period, although making a purchase with the card will extend the validity for the remaining balance to 24 months from the date of that purchase.